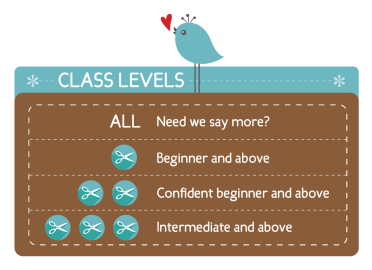 The Granary offers a wide variety of classes for every skill level. Check out the descriptions below and be sure to stop by the shop to see the class samples in person. A 10% discount* is offered on all class materials for instructed classes with your paid enrollment. Open Sew, Double Delight, and Happy Hour classes are not eligible for discounts. *Note: Discounts do not apply to class fees, kits, sewing machines and accessories, certain manufacturer specials, or already discounted merchandise. You may now register for classes online! You may also register for classes in person at the shop or by phone. Class reservations will only be accepted when accompanied by full payment. A supply list will be issued at that time. A 10% discount is offered on all supply list items, including any required books or patterns, with your paid enrollment. Discounts do not apply to class fees, kits, sewing machines and accessories, certain manufacturer specials, or already discounted merchandise. Refunds and/or store credits will gladly be given if you notify us of your need to cancel a class at least seven (7) days prior to the scheduled class date. No refunds or credits will be given if the 7 day notice requirement is not met. We stand by this policy to assure our teachers that the minimum enrollment has been met and to guarantee those taking the class that the class will be a "go". If the Granary cancels a class, a full refund will be given. Sewing machines brought to class should be recently cleaned and in good working condition. Be familiar with the machine and bring any accessories you think you may need, along with your instruction manual. We cannot accommodate children or guests during any of our classes. Our classes appear on the Calendar and are also listed below. Click on the Class title for a more detailed description, difficulty level, and meeting dates.